The Big Horn has all the features you will need to enjoy your campout even when the conditions are extreme. It was designed and built to last and protect you from all the weather you encounter. Even if your weather conditions are mild, you'll still be able to enjoy the added features the Big Horn provides. Included in the Big Horn are extra tall center heights allow you to stand up. Wall dividers to create two rooms. The 150D oxford floor, which is about twice the weight of normal nylon floor material, will greatly increase the durability of your tent. The tent is a free standing three pole design with fiberglass poles and two large doors which allow for easy entry into either room individually. The full coverage 75D 185T Polyester fly buckles on for extra strength and adjustability and will protect you from the elements, even under the nastiest conditions. The fly and floor seams are factory sealed to give you the best weather protection. Included: Rain fly, Fiberglass Poles, Pole Bag, Stake Bag, Steel Stakes, Mesh Storage Pockets, Guy Ropes and Tent Bag. 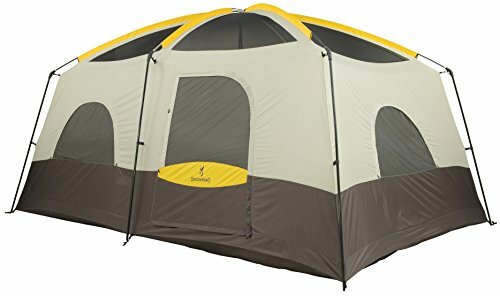 Browning Camping SKU#: 5795011. Base Size: 10' x 15', Center Height: 87", Total Weight: 34 lbs. 11 oz.